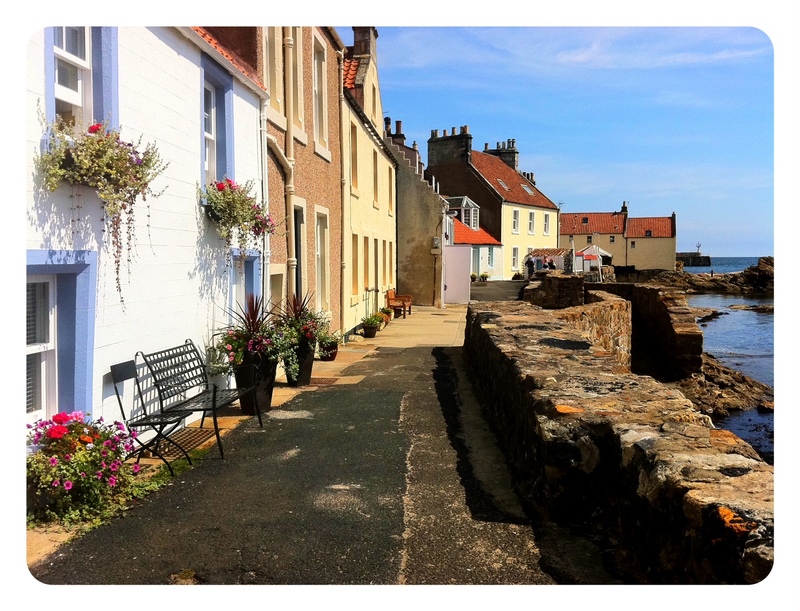 Pittenweem, the picture-postcard fishing village where we are staying the weekend, is gearing up for its week in the British cultural spotlight hosting the Pittenweem Arts Festival (6-14 August). This dinky village, so tiny that it doesn’t have a cash machine, or even the ubiquitous Tesco Metro, hosts one of the best, most accessible art shows to be found anywhere. By accessible I mean that the art displayed is wide-ranging enough to please the culture-vultures (my in-laws) and Philistines (that will be me) alike. Gorgeous, colour-soaked abstract canvases jostle with simple pen and ink studies, blowsy floral whimsies and beautiful sea-inspired tapestries in this most egalitarian of art festivals. Although Pittenweem boosts an unusually high number of galleries for such a bijou place, the ever-increasing number of artists who exhibit over the week means that the ground floors and gardens of many houses are co-opted and hung with paintings, dotted with sculptures and draped with textiles and decorative baubles. The village is always eye-achingly gorgeous, especially the Shore area, with its pastel tied fishermen’s cottages, tumbling gardens and step-gabled roofs, but it really comes alive in August. If you are anywhere near the east coast of Scotland come and have a browse around this uniquely homey art festival. Even if nothing catches your eye art-wise there are always the home-baking stalls spilling out onto the pavement to tempt you. And the Cocoa Tree, where I use coffee-purchased wi-fi for the occasional blog post, has dangerously addictive chilli cocoa to sup while enjoying homemade crepes and other goodies. Great chocolate shop too. The fish and chip shop a few doors down is also a good find. Anstruther, the next village up, has a famous fish and chip shop (it boasts photos of celebs noshing with the plebes from cardboard trays). But Pittenweem Fish Bar is just as good at two-thirds of the price, with efficient staff to keep everyone in their place as they queue down the street for their portions of crisp-golden fish. And no cardboard tray-plates, just good old paper to unwrap while sitting on the harbour wall watching the fishing boats go out for the night. One thing you might not find around here is gazpacho. Cullen skink or lentil soup yes, but probably not gazpacho. My mother-in-law and I have over the years toyed with the idea of making up and selling soup to hungry art buyers – with proceeds to Maggie’s, of course. But with their friends’ borrowed house already busy with father-in-laws paintings and the comings and goings of friends needing looked after, our good intentions have never come to fruition. But we decided on our fantasy soup menu ages ago and cooling gazpacho was top of the list. It is hot and thirsty work shlepping up and down the narrow wynds that lead from harbour to the headland area and gazpacho would, I’m sure, be a welcome repast. Both thirst-quenching and substantial. Maybe one day. This globally-enjoyed soup from southern Spain is the perfect recipe for the non-cook, the hot and bothered, the tired, the rushed and really anyone who loves their vegetables. 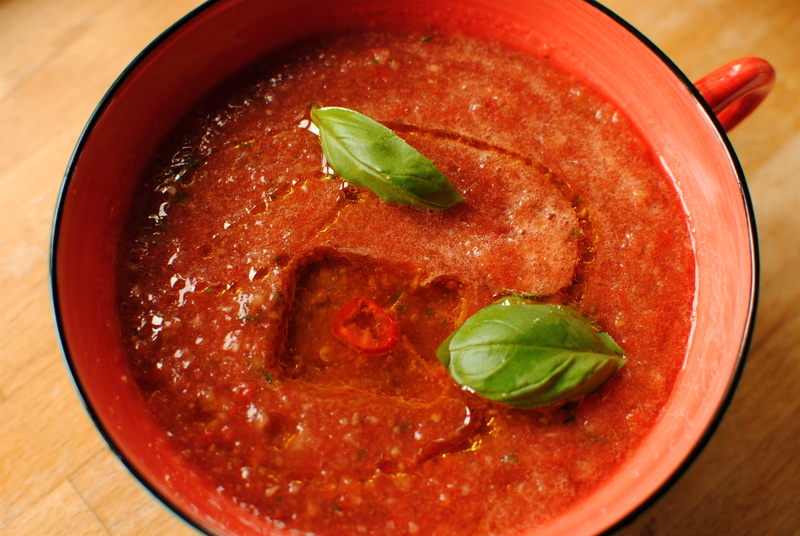 If you’ve tried gazpacho before but never made it, you are in for a pleasant surprise. It is one of those recipes that requires very little but gives so much – taste, looks, body, aroma, nutrients in abundance and what I call the ‘nurture factor’ – that feeling of well-being you get from doing something that combines pleasure and virtue. 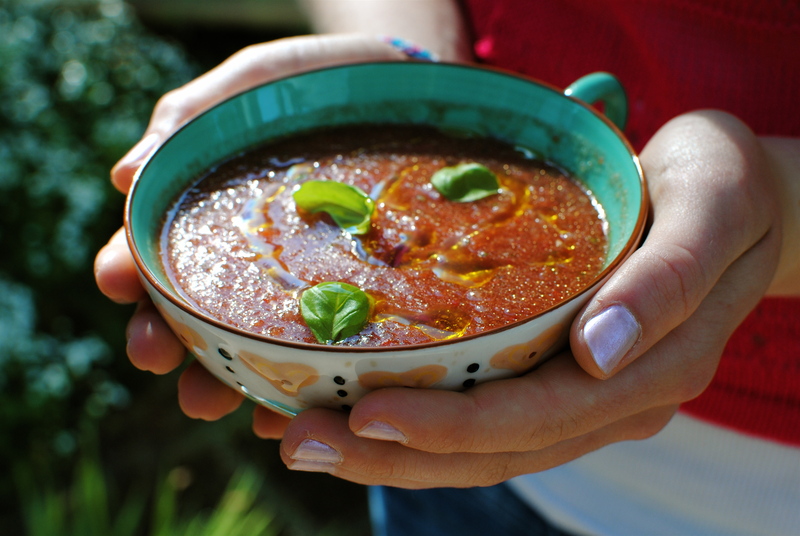 Gazpacho is also my ultimate summer soup, maybe even summer recipe – full-stop. 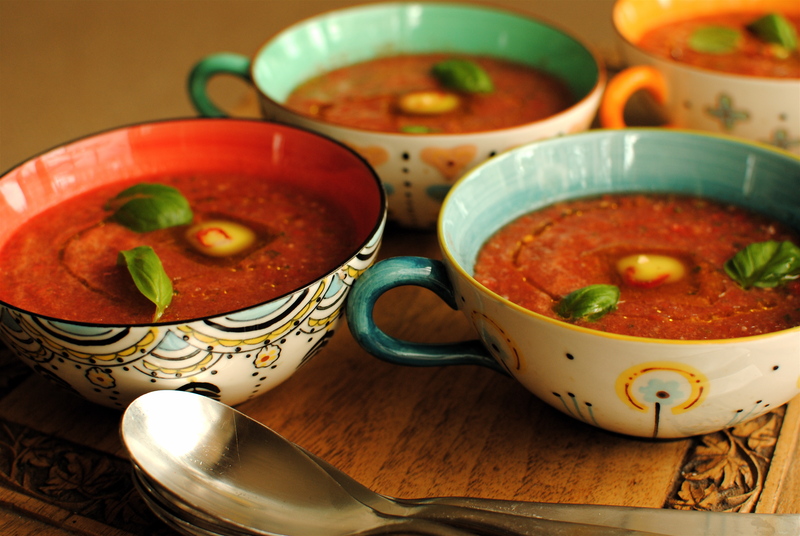 In a contest to decide what is the most summery soup, gazpacho would undoubtedly walk it. Like lots of seasonal soups gazpacho relies on top-notch ingredients; in this case sun-ripened tomatoes and peppers, refreshing cucumbers and pungent garlic and onions. But unlike many soups, you just roughly chop everything, bung it in a food processor or blender and, ‘hey presto’, soup. Maybe add some garnishes, some ice cubes and definitely chill it in the fridge, but essentially it is the Brad Pitt or Halle Berry of soups – effortlessly gorgeous. Minimal effort, maximum taste. The reason I am rather pretentiously calling this a non-purist’s gazpacho is because it lacks an essential authentic ingredient – bread. Call me crazy, but I’m just not sold on the whole bread-as-thickener thing. Float some olive-oiled baked cubes of the stuff on top, fine, but leave it out of my blender. But if you wish to go the purist route chop up some crust-free stale white country type bread (about a cup) and soak it in the chopped tomatoes, vinegar and olive oil for half an hour before blending everything together. Nick a small ‘x’ in the base of each tomato and cover with just boiled water. Leave for one minute then drain and peel. 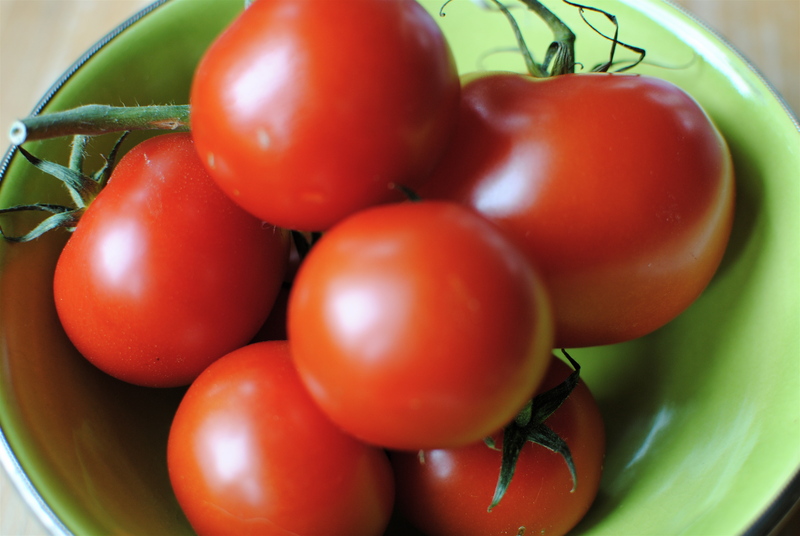 Halve the tomatoes and, over a sieve-covered bowl, use your fingers or a spoon to scoop out the seeds. Press the seeds against the sieve and capture the juice below. Discard the seeds. Cut up the tomatoes and put them in a large bowl. Now the rest is super easy. Chop the vegetables and add them and the remaining ingredients to the tomatoes. Mix and either let them sit and meld their flavours for awhile or immediately put half into a food processor or blender and whiz until smooth. Pour into a large bowl that will fit into your fridge (not essential). You may like to have pre-chilled your bowl. Now add the remaining vegetable mix and whiz, but not so smoothly – a few seconds less. You can, of course have it all super smooth and do it all in one batch. Now taste the soup and adjust the seasoning and acidity to your taste. Remember that if you chill it you will probably want a touch more salt. 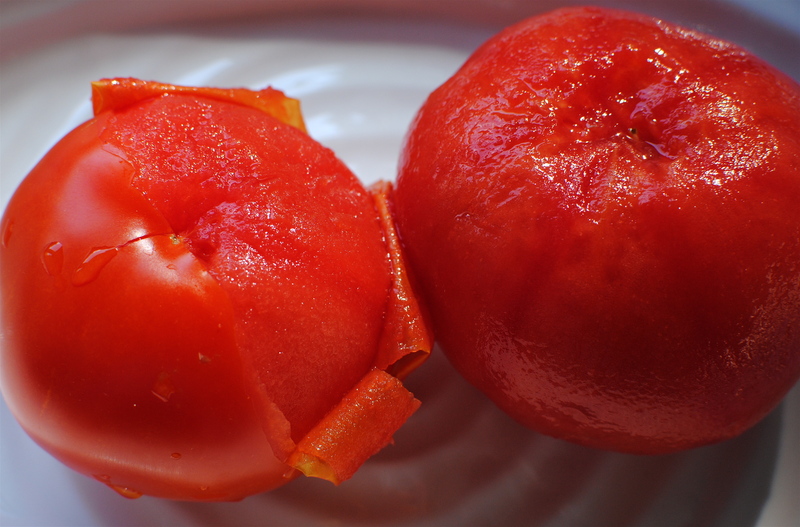 Depending on the tomatoes you may want to add some extra sweetness or some extra vinegar or lemon. It is up to you. I make it different every time. That’s the beauty of this soup, there is no right or wrong way to do it. In fact, for this soup I made olive oil ice cubes with chilli, but they looked like butter pats until they melted into the soup. Not a good look. Optional garnishes: diced hard-boiled egg, diced avocado, croutons or more of the soup ingredients. The protein content of egg would make it a complete meal. I tend to have it with a hard-boiled egg topped green salad, briney olives and fresh white bread. Serves 4. Absolutely, everyone GO. We have had a sneak preview of course, but shall be over at the weekend. Appealing photos, with an inspiring recipe. Living along the coast, with many foggy days, I am waiting for my tomatoes to ripen. When they do,I will try this lovely summer soup. Thank you Deb. I’m not sure where you are (I will check in a mo) but I cheated and used Italian tomatoes as our own ones are taking their time. And with today’s deluge they are getting battered to smithereens. I hope you like the recipe when you do make it. Let me know, especially if you tweak it to your own taste. Thanks for stopping by! I made this last week for friends who have lived in various places around the Mediterranean and they had always found it intriguing that every family had their own version of the soup. When they tasted this they all said it was the best they had ever had so bravo Food to Glow another cracking recipe. Actually I found it rather addictive and am making it again today despite the rather rubbish weather – the aroma in the kitchen is wonderful. Thank you. Thanks so much for that feedback! It is immensely gratifying to know that what I’ve cobbled together not only works for me (us) but for others too. You are too kind with the fulsome praise. I hope you gave them my blog address! And, I hope now that school is almost back that you will get your house back to yourself too. We were in Pittenweem in June. I love the East Neuk. Great blog will be visiting again. Thanks so much Janice. Pittenweem is one of my absolute favourite places. A Swiss friend has a cottage right on the Westshore overlooking the water. We are lucky enough to get to go there whenever we like (not often enough for my liking though). The moment we park the car and schlep up the lane trailing all our bits and pieces we just melt into relaxation. You can do nothing but relax in PIttenweem. All of the East Neuk is wonderful. Next time you are there go to Anstruther to the golf course. They have a wonderful unassuming looking restaurant called the Rockies. It looks (is!) a bit of a portakabin but the food is really fabulous, with linen cloths and fresh flowers on the table. Thank you for stopping by and commenting. I will visit your blog too! I was reading your Roasted Nicoise salad with burrata and I found “A Non-Purist’s Gazpacho” mention. I must say that a real gazpacho will never be thicken with bread. 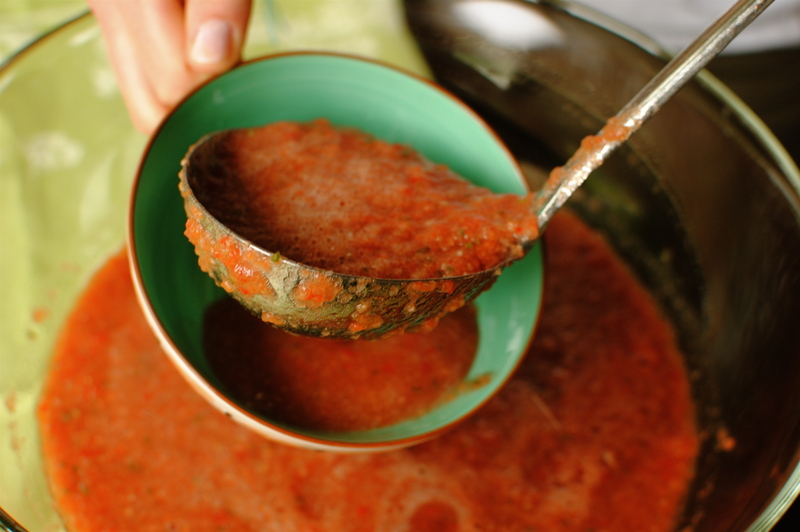 You may serve some crumbs of bread as a garnished but the best gazpacho is that one that is thinken just by good meaty tomatoes, cucumber, onión, green pepper and just some part of a garlic clove. The best way to get a good texture is to diced all vegetables add the vinegar, sugar (just to take acidity excess out), salt and finally the best olive oil (virgen extra) that one can find. Leave it in the fridge during a night and next day right to the blender. Believe me, you are not quite far from making a authentic gazpacho with some extra touches of your own. Thanks for taking the time to click through to the link. I don’t add bread as I really don’t like it in gazpacho. Other ‘authentic’ recipes and some ones I have had in Spain seem to include bread, so maybe it’s a micro-regional thing, I don’t know. I do like it as you described and I think my recipe comes pretty close to the best that I have tasted when in Spain. I certainly agree with the chilling overnight – if you can wait that long! Bread is a good way to increase the amount of gazpacho, add less tomatoes and more water.. 🙂 and you may get it that way in many places here in Spain but as I said before yours is more likely to be an authentic gazpacho. ¡¡Enhorabuena!! and thanks responding to my comment. Your welcome! I really appreciate your kind endorsement. I was in Sitges a few weeks ago but as I had sinus infection I wouldn’t have been able to tell a good from a bad gazpacho. I hope to return some time in the Autumn and have more of a food adventure. Italy will have to do meantime 😀 Btw, what’s your name?